When the world shakes beneath your feet, when something just isn’t right, when all your senses tell you to stop, hold, even turn around, or even more, RUN! That’s what you do. It’s self preservation. Fight or flight. It may save your life. On the other hand, it may make you look silly and turn panic and fear into simple nervous giggles. But it exists and to ignore that would be silly as well. 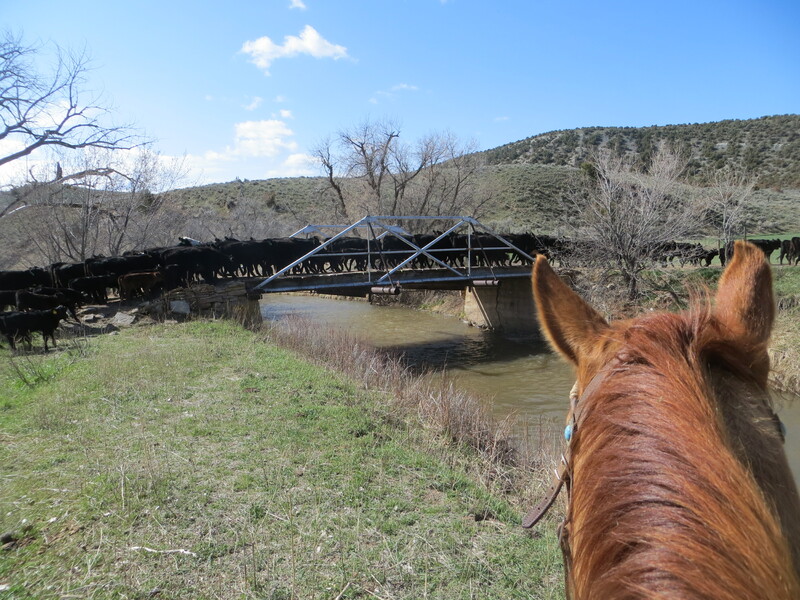 That’s what I try to remember every time we take steers over a bridge. Everything screams to them that *this isn’t right*. That the hollow sound beneath their feet belongs to a monstrous troll. That the sight of rushing water seen from this angle is new and untrustworthy. That at any split second, the wood and steel smell that surrounds them is a toxic combination ready to flash into their lungs in a searing flame. Steers don’t know. They’re a year old. Cows know they’ll be safe, but cross in a determined *don’t-look-now-just-keep-trucking” mode. They can both give you fits, refusing to cross. It’s here that patience is tried. Stockmanship needs to outweigh frustration. All it takes is one feeling secure. And maybe a little hay to entice the first step. Wow, this one begs for a video. Yes, good stockmanship, experience, some hay, and a confident leader to follow. I hope after a few tries over the bridge that they get accustomed to it? Is panic catching? Do you ever have the entire herd running frantically in the wrong direction? How do you stop/turn a stampede? Also, are the groups permanent, or do cows and steers move from one group to another? Does that change the group dynamics? I feel the same way about bridges. It takes all the nerve I have to go across one. 04-23-15: Wordless Wednesday - "Lookin' Back"